When Jennifer Hudson arrived at the Power of Women awards show wearing a Samsung Galaxy Gear Watch that had been encrusted with diamonds by Brilliance jewelers, she probably gave little thought to the saga behind the sparkle. For Hudson it was just a watch, but like every piece of jewelry sold by Brilliance, the watch that the “Empire” actress wore that night had a story. It was hand crafted by their own people in their own shop. It was — like everything designed and created by Brilliance — more than a piece of jewelry. It was a labor of love. At first glance, Florida-based Brilliance is just another high-end online jeweler. But a closer look reveals genuine passion and a customer-centric mentality that is rare among online diamond merchants that operate behind the anonymity of a website. Along with custom-designed jewelry and conflict-free stones, Brilliance works with every customer to provide support, guidance and education throughout the purchasing process. Brilliance counters common industry stereotypes by working to forge bonds with their buyers. Although the modern incarnation of Brilliance is just nine years old, the company has been in the jewelry business for three decades. Ohayon and his team started by crafting, creating and selling custom jewelry to jewelry stores, which then sold his pieces to customers at a markup. The eureka moment came 12 or 13 years ago when the team created a $100,000 dollar bracelet for a congressman. 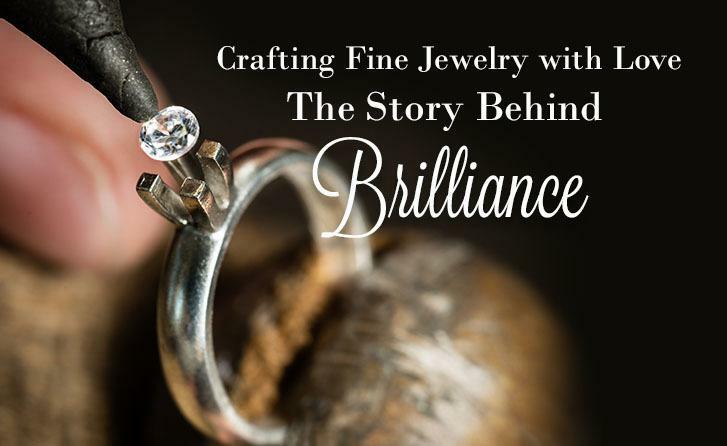 From planning to design to selection to assembly, Brilliance did all of the creative and physical work — only to have the jewelry store sell it as if it were their own. Brilliance has been an independent B2C enterprise ever since — but their guiding principles never changed. Their strategy has led to impressive growth. Although it started as a team consisting of just Ohayon and two others, Brilliance now employs 21 people with a number of additional contractors on permanent retainer. He trains every employee personally on every aspect of the job. He attaches emotional — not just monetary — value to each and every item that leaves the shop. Their passion for customer service is revealed in a true story that Ohayon is proud to tell. A customer in New York City needed a specialty ring finished with just three days notice. With barely enough time to make the custom piece in a way that met their high standards, there was simply no way they could have it shipped to the Big Apple on time from their location in Florida. “I flew to New York City and personally delivered it to him myself,” Ohayon said. It is not just talk or a turn of phrase; Brilliance really does go the extra mile for their customers, in some cases over a thousand miles. In an industry where some of the best-known brands don’t even make their own jewelry, Brilliance is committed to separating themselves from the pack by reimagining the entire shopping experience. For Ohayon, stores like the kind to whom he used to sell back in the old B2B days can never achieve the same level of passion or commitment to the product as those who create and craft it with their own hands. Brilliance operates in a crowded, competitive field. They had the courage to take the leap from creating pieces for sale in jewelry stores to selling directly to customers. They established their brand and carved out a niche in the market, but in the end, it is Jonathon Ohayon’s customer-centric business model that is responsible for the company’s growth and success.